The atmospheric old school football ground Seel Park hosted the Evo-Stik Division 1 West match of the day between Mossley and Atherton Collieries. Both sides were bang in form having garnered nineteen points apiece from their previous seven outings and looking to further enhance their promotion credentials. Something had to give! Colls made one change from the starting line up which beat Kendal Town last time out with Dave Sherlock replacing Connor Gaul. The first period of the game certainly reflected both sides absolute desire for the three points as attacking football was the name of the game but both defences were on their mettle and kept clear cut chances to a minimum. Tom Bentham had an early chance to add to his record breaking six goal salvo of last week but he could only direct a tidy Ben Conway centre into the hands of Josh Ollershaw. The Lilywhite’s joint top scorer Max Leonard hit a rasping effort from distance which Greg Hartley somehow diverted onto the crossbar. Mossley’s Ben Richardson provided the standout chance of the half on 33 minutes. His free-kick by the dugouts evaded the gaggle in the packed penalty box and it was partially cleared of the line. 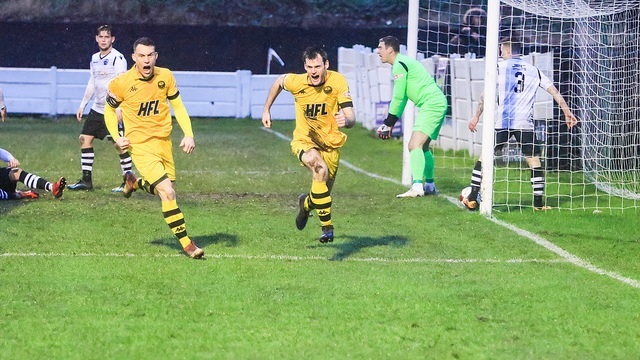 The rebound, directed towards goal, was again cleared off the line by eventual man-of-the-match Ian Rowlands and into the relieved bread basket of Greg Hartley. A huge sigh of relief from the three figure Colls Mon following. More luck from judgement. Colls were perhaps the happiest when referee Moreland blew the whistle for half time but they knew it still all to play for. The livery home choir in the spacious covered terrace behind Hartley’s goal found their collective voice immediately from the restart with the custodian the main target of their warbling. Driving rain haunted the second period throughout but Cleggy’s boys upped their tempo. Hartley hit a perfect long ball forward from goal on 52 minutes which saw Ben Conway break down the wing. The midfielder cut inside and dinked an effort at goal, smart defending saw Mossley saw it put behind for a corner. After a fantastic game last weekend, Oliver Roberts swung his delivery into the box, straight to the head of defender Rowlands who earlier saved his side. His diving header bulged the net. Deadlock broken, advantage to the league leaders. Hartley turned to his fan club, a solitary finger to his lips spoke a thousand words. On 65 minutes Ben Hardcastle ghosted past his man and smashed a shot that keeper Ollershaw managed to tip onto the bar. Sensing another goal was on the offing, Hardcastle went up a gear, firstly nearly embarrassing the keeper by deflecting his clearance narrowly then managing to double the lead on 73 minutes. A spectulative shot from distance skidded across the now saturated surface and through Ollershaw. It was Benaldo’s fifteenth goal of another productive campaign. Despite the deteriorating conditions, both teams continued to test each other. Late Mossley pressure was simply soaked up by Atherton. On 89 minutes the whites had their best opportunity of the game. Adam Jones was played through, but the central defender shot agonisingly wide. James Kirby and Adam Farrell manufactured great chances for themselves but the Mossley defence weren’t for conceding a further strike. Ultimately, it was a superb team performance from Michael Clegg’s side. Defender Ian Rowlands at the centre of the action as Colls registered their first league victory at this picturesque Pennine ground at the tenth attempt. Another fine advertisement for Evo-Stik League football product.